In our "math" series of variations, the values of the numbers matter. The Even And Odd variation has colored regions that indicate which entries are even and which are odd. The numbers 1--9 must each appear exactly once in each row, column, and block, and in addition, the blue cells contain only even numbers (2, 4, 6, or 8) and the green cells contain only odd numbers (1, 3, 5, 7, or 9). 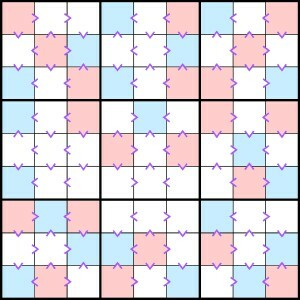 This example of Even And Odd has difficulty level 1 out of 3. Tip: Each Even And Odd puzzle is really two separate sub-puzzles -- one for the even numbers, and one for the odd numbers. You can solve each of these sub-puzzles independently. This time the board is subdivided into three types of regions, each which can only hold a certain type of number. The numbers 1--9 must each appear exactly once in each row, column, and block. In addition, blue cells can only contain 1, 2, or 3; light purple cells can only contain 4, 5, or 6; and dark purple cells can contain only 7, 8, or 9. This is an original Brainfreeze variation. This example of By Threes has difficulty level 2 out of 3. Tip: Like the Even And Odd variation, By Threes contains separate sub-puzzles -- although this time three sub-puzzles instead of two. For example, you can fill in the blue cells without considering any of the light purple or dark purple cells. In this variation the colored regions tell you what can't be in certain cells; specifically, the size of each region is excluded from that region. The numbers 1--9 must each appear exactly once in each row, column, and block. 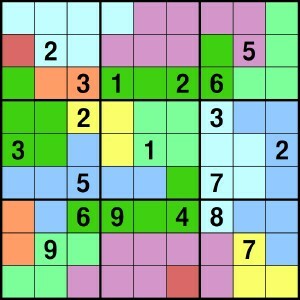 In addition, each colored region excludes the number that is the size of that region; for example, a region with three cells cannot contain the number 3. This example of Exclusion has difficulty level 2 out of 3. Tip: Sometimes you can quickly use the exclusion rule to exclude a particular number from a large number of cells in one of the rows, columns, or blocks of the puzzle. This can help you place that particular number elsewhere in the region. 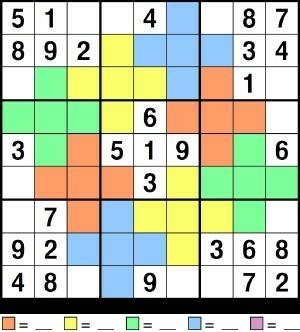 Worms have eaten part of a Sudoku board? Your job is to find out what the worms ate. The numbers 1--9 must each appear exactly once in each row, column, and block. In addition, each worm consists of an increasing sequence of numbers from tail to head (not necessarily sequentially). For example, a worm of length four could contain the numbers 2, 5, 6, and 8, in that order from tail to head. Green worms have their heads marked with "eyes", while blue worms do not have their heads marked (so you have to figure out their direction). This is one of our favorite original Brainfreeze variations. This example of Worms has difficulty level 2 out of 3. Tip: The usual Sudoku rules apply, but you'll spend most of your solving time considering the possibilities for the worms. The clues outside the worms can greatly reduce the possibilities that can go within the worms, if you consider the increasing/decreasing conditions. Mark the blue worms with eyes as soon as you can figure out their direction. This variation has no initial clues, but there will still be only one way to complete the puzzle! All the information you need is in the "greater than" conditions. The numbers 1--9 must each appear exactly once in each row, column, and block. In addition, adjacent cells must obey any "greater than" (>) or "less than" (<) symbol that appears on their dividing line. As an aid in solving, some cells have been shaded. Cells with a lower value than all of their neighbors are blue; cells with a higher value than all their neighbors are red. This example of Greater Than has difficulty level 3 out of 3. Tip: Try to place the highest and lowest numbers first. For example, find all the places in each block where a 9 could go, and then look for rows and columns that only contain one of these possible locations. Then see what you can do for 8's, then 7's, and so on. Note that red cells don't necessarily contain 9's, but that 9's can only appear in red cells. 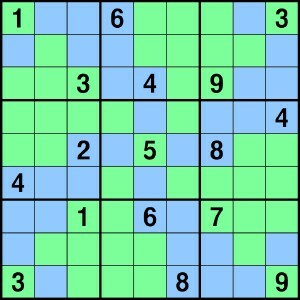 Who says Sudoku puzzles can't have math in them! 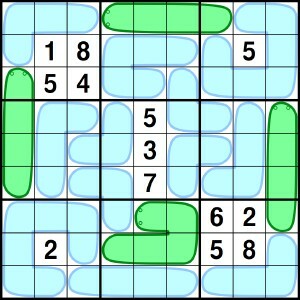 As in the popular game Killer Sudoku, certain regions add to certain sums. The twist here is that you don't know what those sums are! 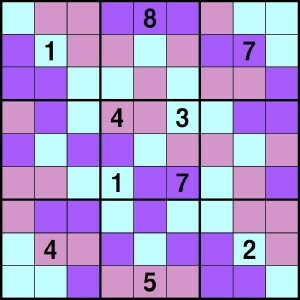 The numbers 1--9 must each appear exactly once in each row, column, and block, and there are no repeated entries in any region. In addition, all shaded regions of a given color add to the same sum; for example, if one red shaded region has entries that sum to 21, then all red shaded regions in that puzzle sum to 21. The sums are not given; you must determine them yourself. This is an original Brainfreeze variation. This example of Sums has difficulty level 3 out of 3. Tip: Even knowing just a range of possible sums for a given region can help you determine which numbers could possibly go in a similarly-colored region. Also keep in mind that the number of cells in a region restricts the possible sums for that region.